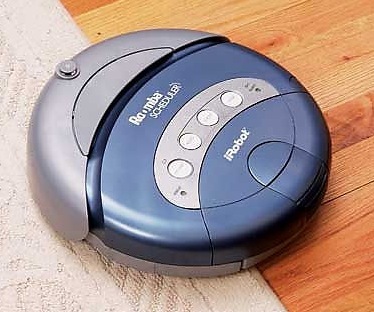 What if Roombas were half the diameter they are now and you could deploy six of them to scour your room? Smaller units could maneuver into smaller spaces. Sure they wouldn't hold much but they could regurgitate their collections in the middle of the room for the parent Roomba to clean up. Mesh network the whole bunch and let the smaller units dock to the parent bot for recharging. The parent unit would be designed to transport and recharge the smaller units, clean up the dumpings of the smaller units and return to the master charging station. Toro and Roomba, What if they Mated? I am having a lot of good response to my new blog Disabled Hands. 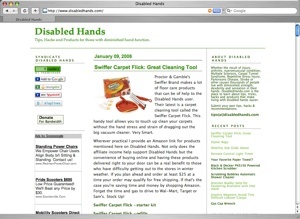 I am providing helpful tips, hacks and product reviews and recommendations for those who have diminished hand function. There are many people who have an injury or chronic condition that affects their hands and their ability to effectively and efficiently accomplish daily tasks. This blog is for anyone who has hand issues as simple as a broken wrist or as debilitating as arthritis, multiple sclerosis, stroke paralysis, quadriplegia, etc. Many of the tips, tricks, hacks and products would serve those with carpel tunnel syndrome, chronic fatigue, fibromyalgia, Parkinson's disease, tremor. Basically, you or someone you know could benefit from reading Disabled Hands. If you're a cool kid grab the feed. 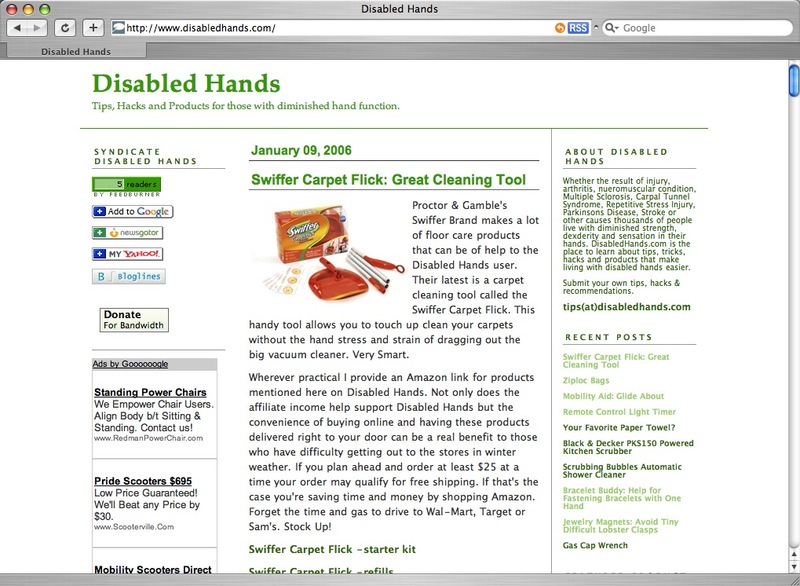 You'll also notice the Disabled Hands headlines over on the right sidebar. It's a Cleaning Robot Christmas. Three of the top 15 (as of this writing) items on the Kitchen & Housewares Top Sellers list at Amazon.com are cleaning robots. Could it be the ultimate husband gift for the practical woman? A cool techno gadget he can play with while also a "practical" gift for the woman. Do women really see the value in things like Roomba robots or would they rather have one of the goodies on Oprah's favorite things list? So much energy and attention is focused on making humanoid robots but it's these types of limited function robots that will rule the day for the immediate future. Viva la machina! 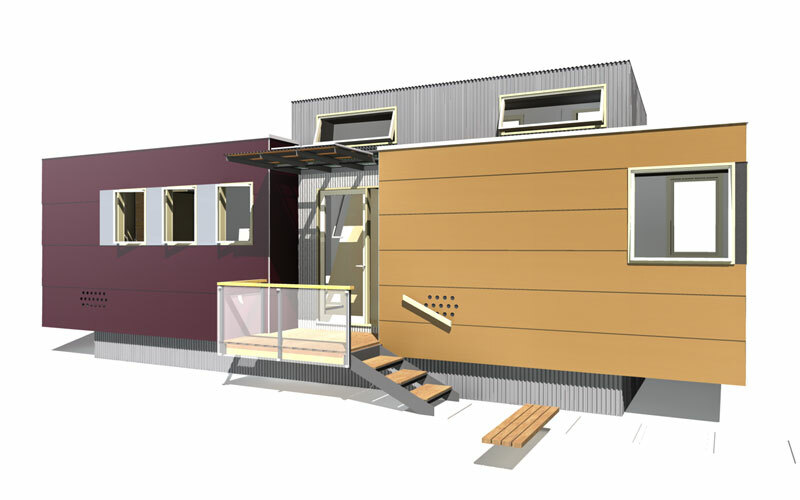 Our friends at TreeHugger point to this amazing modern prefab that is way eco-friendly. 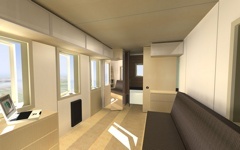 Intended to be a new kind of mobile home this 350 sqft. dwelling brings real style and design to the Live Tiny market. 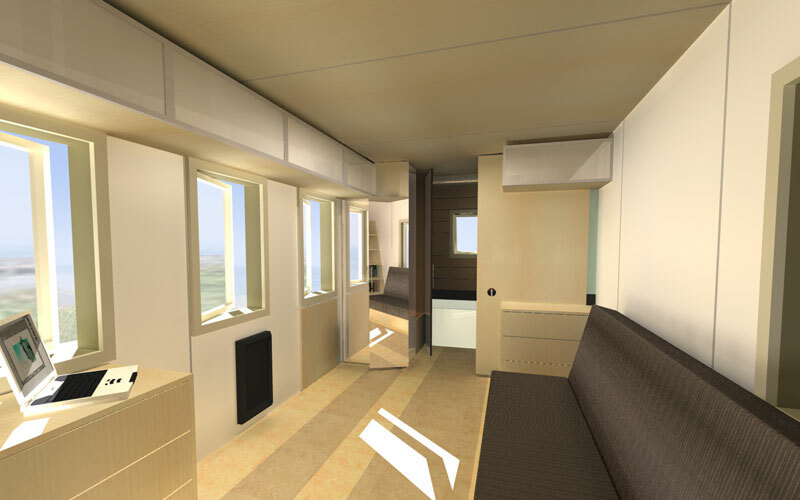 In house obsessed (and poor) America 350 sq.ft. won't appeal to many people but it does give a great option for single people who don't want to be slaves to their mortgage payments and home care requirements. Many smart people chose to live tiny so they can live large in other areas of their lives. If you think I'd like to park a Smart Car out front you'd be right. Check out the TreeHugger post for more details and pics. Some time ago I wrote about Build-a-Bear Workshop and their focus on the customer experience in their stores. This holiday season they have launched an aggressive TV advertising campaign that I hope is driving sales. It certainly seems to be driving interest and traffic to my original post. Many people seem to be interested in opening a franchise closer to their own home. This seems to be a success indicator as these people have had a good experience or feel they would have a good experience and want to replicate the experience for others. 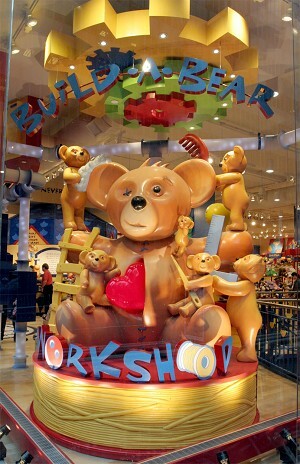 Is Build-a-Bear Workshop(BABW) ready for massive expansion? I think not. The worst thing they can do is over expand and saturate the market for stuff-it-yourself plush animals. If every mall in America has a BABW it will be unbearable to say the least. Right now with 180 stores domestically their isn't much risk of over saturation but they best not expand too fast. The brand depends on a certain specialness to the experience. It adds to the experience if customers encounter the stores while traveling to tourist destinations. It adds to the souvenir aspect of the product. What they are selling is the experience of making and dressing the bear. The product(the bear) that customers take home is a souvenir to remember the experience. Therefore the experience must be fantastic. After all, if it was just about the plus animals they could be sourced ever cheaper from any number of off shore sources. Build-a-Bear, keep your experience special. Keep your domestic stores corporate owned and controlled. Focus on creating experiences people will travel a hundred miles or more to enjoy. I continue to see people flying in to visit the American Girl Place store on Michigan avenue in Chicago. Competition will com from the likes of Bear Mill and others but they are franchising their stores and so may not be able to provide the highest quality of customer experience. BABW has seen the opportunity to offer similar experiences for older tween girls by offering their new friends 2 be made line of dolls and outfits. A good move for a company that appeals to young children who quickly out grow their offerings. I moved this past year and I am still looking for many things. I can't remember which box they were hastily packed in. I didn't have time to make detailed labels for each box. I should have just captured the contents of each box in a digital picture keyed to the box. There are so many small things missing in action that I can't even remember all the things I am looking for. So I am starting a "Things I am Looking For List." In households where there are multiple residents it's a good idea to publish a "looking for" list so that others can help you find what you are missing. Something else for the refrigerator door. By the way this would be a good use for a wiki in a workplace. "Have you seen..."
I can't wait until the RFID revolution kicks in and everything I own will be tagged and my computer through a series of RFID readers will know the exact location of every single item in my house. "The match for that sock is still in the cloths dryer." or "That tacky hip swinging dancing singing Santa Claus the boss gave you is in box number 1389 in the basement." Until then I'm still looking for a particular power cord and my new winter gloves among many other things. Yesterday, I posted at BeConnected about Luxury Hotels and how they are using computer networks, databases and automation to seamlessly customize their rooms to enhance the guest experience. Hotel staff notice guest preferences and update guest profiles for everything including temperature, drapery positions and mini-bar preferences. The system even tracks preferred music choices, TV programming and even frequently dialed numbers on the telephone. Gathering all of this customer intuition data helps hotels retain frequent repeat customers. So how much is a persons preference profile worth? What is it worth to a hotel to know that a guest prefers diet Pepsi vs diet Coke? What about their allergy to feather pillows? What about the fact that a customer is a recovering alcoholic and wants no alcohol in their room and no service at the hotel bar? Each of these pieces of information have different values to the hotel and to the customer. It's an exchange of information for time, convenience, comfort and maybe even survival. I think there's room for a trusted personal preferences profile provider that collects and provides preference information to businesses serving profiled customers. Businesses could subscribe to the service to find out relevant information about their customers. Customers would participate to enhance their experience. Part data mining operation, part concierge, part social network, part travel agent, part personal shopper this service would tailor your life experience to your preferences. The more the service knows about you the better your experience. Everything from remembering your father-in-law's birthday and prompting you with the perfect gift ideas to arranging your holiday travel according to your travel preferences would be handled seamlessly. Your dietary restrictions and preferences would be cross checked against restaurant menus when you seek a recommendation or reservation. The service would not send you to restaurants it knows you would not like. The service would make a reservation for you, provide GPS directions to the restaurant, arrange car/taxi service if needed, provide parking assistance, send you menu selection recommendations, place your food order in advance, order your beverages, pay the bill and tip the wait staff. The social network aspect could alert you to the reviews of friends and contacts who have recently patronized the restaurant or even those currently in the restaurant. The benefits to the consumer are clear. The benefits to the subscribers like the resaurant are happier repeat customers who spread good word of mouth which results in more business. This would be a huge service but for services like Google, Yahoo and Amazon this would be doable. Hey, if you haven't clicked through and visited the blog recently come on by. Be sure and take the Thinking Poll while you're here. RSS is a great thing but sometimes you just miss people coming by the place. Please say hello in the comments. Every once in a while I run across the future of the music industry. While the music labels(RIAA) fight to protect the status quo from which they profit hugely while the majority of musicians struggle to survive, some musicians are finding their way in this new world of digital tools and experiences. The path from unaware to raving fan is shorter than ever before. It used to be that musicians had to be "discovered" by the record industry who was looking for a profit vehicle to build their own bottom line. Everything was to the advantage of the record company. Commercial radio play was everything and those that had it had a chance those that did not didn't have much of a chance to even break even with their recording and tour expenses. No wonder there were payola scandals. Radio station programming directors and DJs had the power to make or break a music act. I think we all know something of how it has been. Now we see how it could be. Musicians can rise or fall based on talent and story. There are new promotion pathways to expose new listeners to music and musicians they have not heard before. Just this morning I heard on a popular podcast a song by a group I had not heard of before. The song was from the Podsafe Music Network. This is a web service that connects musicians and podcasters and provides free music tracks that podcasters can include in their shows as long as they provide proper attribution and links to the musicians and the Podsafe Music Network. Podcasters report back to the service when they play a song the network reports back to the musicians when their music is played. It's a win win for the musicians and the podcasters. The path for those discovering new artists is smooth and easy. Hear new music on a podcast. Click through from the show notes to the Podsafe Music network, listen to additional songs by that artist, click through to the artist's website, read the background, tour information, learn about albums, subscribe to their blog and their own podcast all so you can experience the story of the music group. At any point along the way you can click trough to iTunes and purchase the music. First listen to revenue is but a few mouse clicks. No need to remember the musicians name and drive to a music store to buy the album. All this without the radio, the record company, physical distributors, managers, publicists, or record stores. Is it any wonder that the status quo players are fighting for their survival while the emerging interests like Apple iTunes, The Podsafe Music Network and the many popular Podcasters are flourishing. The ground is shifting. So what's the path I followed. DSC 250 (Adam Curry's Daily Source Code podcast) ---> DSC Wiki shownotes ---> Lascivious Biddies page on the Podsafe Music Network ---> The group's website ---> iTunes music store album purchased. Along the way I subscribed to the BiddyCast podcast so I can experience the ongoing story of this great group. So today I went from not knowing this group to becoming a fan, purchasing their music, joining their direct communication channel(giving them personal permission to communicate and market to me) and now blogging about it. That times thousands and millions is the future of the music industry. If you like smart writing, tight musicianship and beautiful feminine harmonies you'll want to discover Lascivious Biddies also.